My Hope Fulfilled: Blog Award! I've seen these flying around, and just got nominated by my friend Amber from high school. 1. I pride myself with remembering dates and weird numbers. I have a thing about 12 (6, 24, etc). 2. I am learning to give up control. The hard way! 3. Through the hard learning, I am realizing the absolutely amazing support I have in my life through Herb, family, friends, church, and yes, even facebook. 4. I love making our house a home. From grocery shopping to painting. I long to make this place Herb's oasis. 5. I looooooove TV. Love it. I know, I'm a loser. 6. I haaaaaaate sporting events. You all know that already, this is jsut a reminder. I've been getting too many inviations lately, so I thought I should refresh your memory. 7. I like when our cat cuddles with us, but I love that she's not a cuddly cat. That means when she does she really loves us. Okay, I only did 12! (Ah, see, it's that 12 thing again). Thanks for doing this! 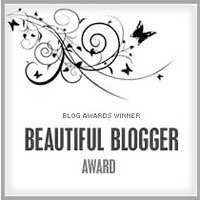 It almost felt like a chain-letter, but who can resist being called a Beautiful Blogger? I love reading your site-- thank you for your transparency and your willingness to let us all be part of your adoption journey. praying for you and herb and the little one. where ever he/she is!